Hailing from Midland Park, New Jersey, Skycast are a fresh modern metal duo comprised of vocalist Chris Ferolito and multi-instrumentalist/producer Aaron Chaparian. ‘Just how fresh are they though?‘, I hear you ask. Well, they’ve only started recording together under that moniker in October. Yes, you read that right: October, as in last month. Talk about a quick turnaround period! The two set out to combine elements of metalcore, groove metal, and ambient music in their work; the fruits of their labor as Skycast up to now bear the form of a song called “Unrest”! …goes to show that there lies a good amount of promise in Skycast‘s formula. Chaparian’s meaty djent grooves and chiselled riffs meet bits and pieces of ambient background atmospherics, making for a well-rounded first impression. Vocalist Ferolito proves himself more than capable of carrying a tune with his empathetic delivery, although I must admit that I’d like to see him fine-tune his lyricism in the future – the words he put to “Unrest” are a bit too close to clichéd metalcore truisms for my tastes. That’s but a minor complaint in the bigger picture, though, as his vocal performance can easily overshadow any occasional slips in lyrical quality. The combination of musical elements seems very deliberate and carefully crafted throughout the track, and when they fully interlock, “Unrest” becomes a highly satisfying listen. Not bad for what is essentially a first taste of their full potential! The artwork they’ve chosen to accompany the release of this, their début single, is quite the stunner in and of itself. Created by Sigma Visions, it depicts an array of celestial bodies apparently being absorbed by a spiraling vortex clouds that’s glowing in an ominous orange hue. Being placed in this astonishing scenery gives the centered band name and song title a real sense of gravitas, but aside from that it just looks damn cool, plain and simple. 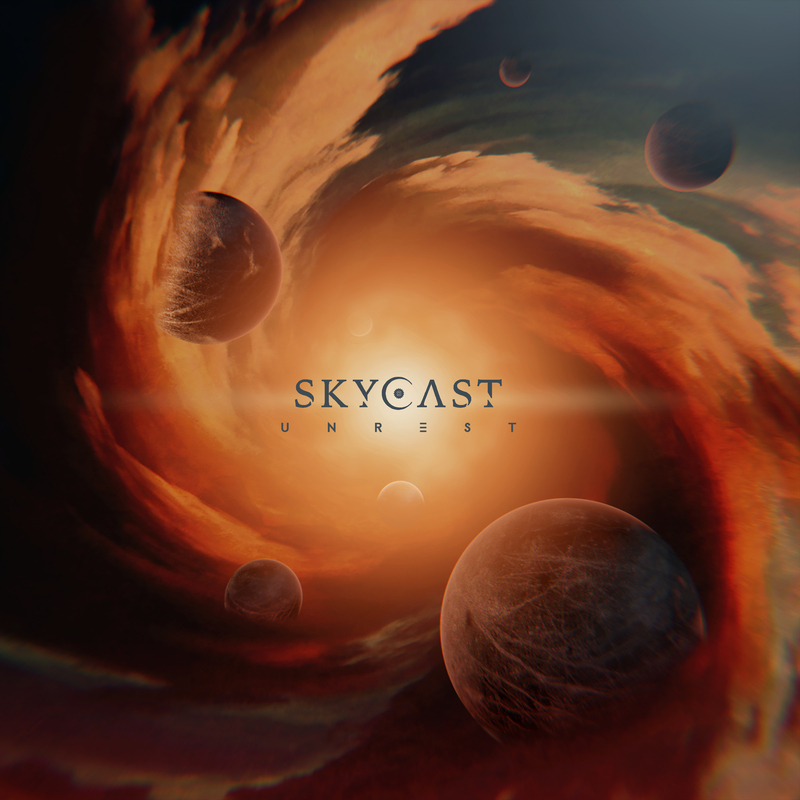 Follow Skycast on Facebook if you liked what you heard above with “Unrest”, and be sure to purchase the song on their Bandcamp to support this young duo of prog metalcore upstarts! Previous PostCold Night For Alligators - "Fervor"